You'll be £16.99 closer to your next £10.00 credit when you purchase The Wildlife Gardener. What's this? Order within the next 2 hours, 58 minutes to get your order processed the next working day! The Wildlife Gardener is a book which helps you to create wildlife habitats in your very own garden, and is very handily split into sections on shelter, food and water. Kate gives advice on the best nectar and pollen plants to grow, dos and don'ts of bird feeding and organic methods of pest control.There are also 10 step-by-step projects that will help encourage wildlife into your garden, such as: creating a bumblebee nester, making a green roof and building a hedgehog box. With step-by-step pictures to help you follow the instructions, these homely creations are all achievable in a weekend and are suitable for even the smallest gardens. Also included is a mini field guide, which will help you to identify the birds and other creatures that you are likely to spot in your garden. Kate gives tips on particular species, explaining what to look out for and how to cater for specific birds, mammals, bees, butterflies, moths and pond life. The Wildlife Gardener is a passionately written, practical book that is essential reading for those who would like to make homes for wildlife in their garden. As a lover of the great outdoors and nature, this book is an excellent resource tool to help you create a home wildlife habitat for every countryside creature that you can possibly think of. This excellent reference is written by, Countryfile presenter and Gardener’s World’s very own Kate Bradbury, who seems to live and breathe wildlife and gardening, and she is also the first Butterfly Ambassador for the Butterfly Conservation. The Wildlife Gardener is split into handy sections on shelter, food and water, and is full of amazing, practical and easy advice on the best plants to grow to attract a variety of garden visitors. Personally, I found the information about animals I already encourage into the garden, like birds and hedgehogs, most useful. But equally, having read the book, next year I will also encourage other creatures like bees. I also have to compliment Julie Watson on the beautiful photographs. A book for life… and lives! Inspired and inspiring, "The Wildlife Gardener" is an extraordinary and thoroughly 'user friendly' instructional guide that is beautifully and profusely illustrated throughout. An engagingly written and consistently engaging study, "The Wildlife Gardener" is unreservedly recommended for personal, professional, community, and academic library Gardening instructional reference collections and supplemental studies reading lists. This one-stop guide to gardening with wildlife in mind is a must-have for any gardening library. The book will help you welcome everything from birds to creepy crawlies. Each section includes 10 things to do for the particular species of wildlife. Most of the included projects are very easy and can be done with items already in your garden. I think my favorite is the bumblebee nester. The final plus of this book is the list of plants including trees to plant for wildlife. This is a great book for gardeners who want practical advice for welcoming wildlife into the garden. The Wildlife Gardener is a practical, easy-to-follow guide to creating a helpful habit for wildlife in one's own garden. Chapters cover how to ensure one's garden provides shelter, food, and water for natural creatures; the optimal nectar and pollen plants to grow; the do's and don'ts of bird feeding; organic methods to keep pests under control; and more. Ten step-by-step projects, a mini field guide to identify the wild creatures attracted to one's garden, and plenty of photographs, The Wildlife Gardener is a pleasure to browse and highly recommended especially for nature enthusiasts. A very well put-together book, starting with intelligent reasons for creating habitat for insects, birds, lizards, etc., in a world where too much habitat destruction takes place. A great guide for making ponds, boxes for birds, etc. Very informative. With the increasing pressure on the world’s wildlife comes the gradual realisation of the importance of our own gardens in providing habitats for our native species. 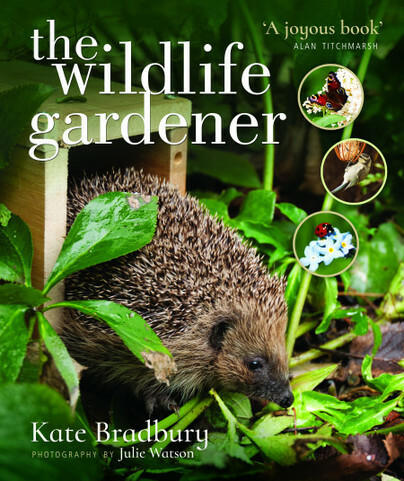 A new book by Kate Bradbury appropriately titled ‘The Wildlife Gardener’, sets out to help you to create wildlife habitats in your very own garden, and is handily split into sections on shelter, food and water. Kate gives advice on the best nectar and pollen plants to grow, dos and don’ts of bird feeding and organic methods of pest control. There are also 10 step-by-step projects that will help encourage wildlife into your garden, such as: creating a bumblebee nester, making a green roof and building a hedgehog box. With stepby- step pictures to help you follow the instructions, these homely creations are all achievable in a weekend and are suitable for even the smallest gardens. Also included is a mini field guide, which will help you to identify the birds and other creatures that you are likely to spot in your garden with tips on how to cater for specific birds, mammals, bees, butterflies, moths and pond life. I really liked this book, it is a great mix of interesting, useful and pragmatic information. Kate recognises that we will not all want to the do the same things or encourage the same wildlife, but gives us the information in order for us to make our choices. This book is a useful guide to new gardeners wanting to attract wildlife and a useful addition to more practiced gardeners who want to ensure that wildlife have a welcome space in their gardens. This is the type of book with wonderful pictures and easy suggestion that made me really want to have a garden! The way the author explains all the little tips and tricks to have the major numbers of insects and wild animals visiting you is super clear and it really seems that everything is possible. The book is quite short, at 120 pages, but packed full of usable, well written, beautifully photographed advice. Wonderful book! I, too, wanted to create a garden that was enticing to wildlife in my tiny suburban backyard. I succeeded, too! This book will help anyone interested in bringing nature into their year. Plant the right stuff and you may even get deer! This book is a great way to learn how to make any form of wildlife habitat in your own garden. No matter what you are trying to attract, from frogs to bee's and insects, butterflies and more, there are concise tips and guides for making items like bird boxes and ponds. No matter what space you have access too for making a garden, with a this book, you can learn how to lay a garden completed with whatever habitat attraction you desire. Filled with beautiful images and helpful advice, Kate's guide is a great way to aid you to create your dream garden. Kate Bradbury is an award-winning author and journalist, specialising in wildlife gardening. She edits the wildlife pages of Gardeners’ World Magazine and regularly writes articles for the Daily and Sunday Telegraph, The Guardian, RHS magazine The Garden and BBC Wildlife and BBC Countryfile magazines. In 2015 she became the first Butterfly Ambassador for conservation charity Butterfly Conservation, and she writes a quarterly column for its members’ magazine, Butterfly. Kate regularly talks at events and festivals, and appears on radio including BBC Gardeners’ Question Time. She also makes wildlife gardening videos for gardenersworld.com. She lives and breathes wildlife gardening, and is currently transforming a tired north-facing patio garden into a wildlife oasis, where she hopes to attract a wealth of creatures including frogs, toads, newts, birds, beetles, hedgehogs, butterflies, not to mention her very favourite, and first love: bees.